Jenn and Romy: Snake eats Gator! This was discovered in the Everglades one week ago: A 13 ft. Burmese python, dead with it's stomach busted open, with an American alligator's tail and rear legs sticking out of it! 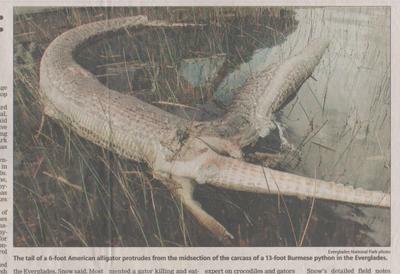 The snake swallowed the 6 ft. gator whole, and both died in the process. The snake is not native to the Everglades, and was likely an abandoned pet. Romy's mom gave me this Chicago Tribune newspaper clipping today. It looks really gross! The Tribune says that the snake was the attacker. Pythons have first been spotted in the Everglades since the 1980s.